There are some ways of processing. 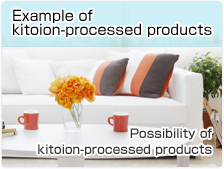 kitoion-processing uses chitosan that is divorced from ”chitin-chitosan” and it bonds with fiber at the molecular level. 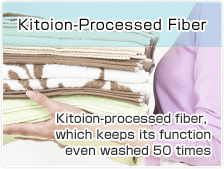 Therefore, kitoion does not separate easily from fiber so that this process realizes excellent fixity and durability. Chitin-chitosan cannot be bonded with natural fiber like cotton until now, so most of kitoion-processing use “binder” to bond with fiber and most of fiber is polyester, rayon, etc. Processing methods other than kitoion-processing tends to change its characteristics of fiber after washing. 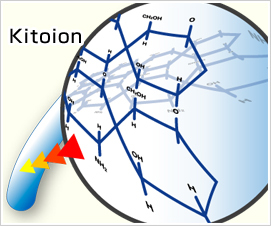 Kitoion-processing less changes characteristics of fiber. Also, it can be applied to natural fibers like cotton and its effect like anti-germ effect does not change even if processed fiber is washed 100 times. ▲Image of the chitosan ionic bonded to the cotton. Only chitosan is bonded to fiber at the molecular level. 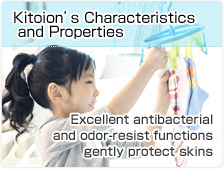 Therefore, chitosan does not separate even if it is washed 100 times so that its effects last. This processing is available to a variety of fiber including natural fiber such as cotton so that it can be used like a way of dying. ▲Image of the chitin-chitosan which is kneaded to rayon. This method kneads chitin-chitosan to fiber so that chitin-chitosan stands out from the fiber. 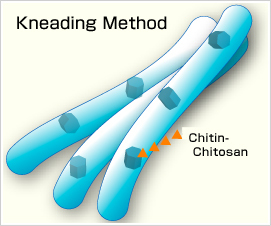 Kneaded chitin-chitosan comes off when the fiber is washed and it returns to raw fiber. Also, this method is only for synthetic fibers like polyester and is not available for natural fiber like cotton. 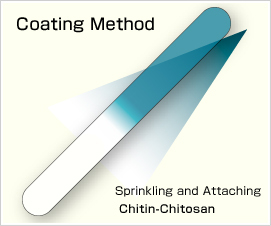 This method sprinkles and attaches chitin-kitsan to fiber. Attached chitin-chitosan comes off by washings and it returns to raw fiber. Let’s compare the effects between Kitoion-pocessing and un-processed cotton fiber. As you can see in the table, about un-processed cloth, the number of inoculums increased from 26,000 to 10,000,000. On the other hand, about Kitoion-pocessing cloth, it decreased. The bacterial number of survivals is under 20. ※As for the processed fabric having immediate bacterial effects, ( the processed fabric increased survival bacterial number from 0h in comparison with the standard fabric ) in the case of failure in a standard calculation test (bacteriostatic potency is under 2.2), it makes evaluate results by using the number of 0h- bacteria of standard fabric on the part of 0h-processed fabric. Ma: Viable bacteria count of 3 samples just after inoculation bacteria for test for Standard fabric or Average value of common logarithms of ATP content. Mb: Viable Cell Number of 3 samples after bacterial culture of Standard fabric for 18 hours or Average value of common logarithms of ATP content. Mo: Viable bacteria count of 3 samples just after inoculation bacteria for test of Antibacterial and deodorant processing fabric or Average value of common logarithms of ATP content. Mc: Viable bacteria count of 3 samples after bacterial culture of Antibacterial (bacteriostatic) and deodorantprocessing fabric for 18 hours or Average value of common logarithms of ATP content. Depend on the conditions of processing methods, the effects may differ from the results. Please feel free to contact the information counter at our executive office if you need more details.